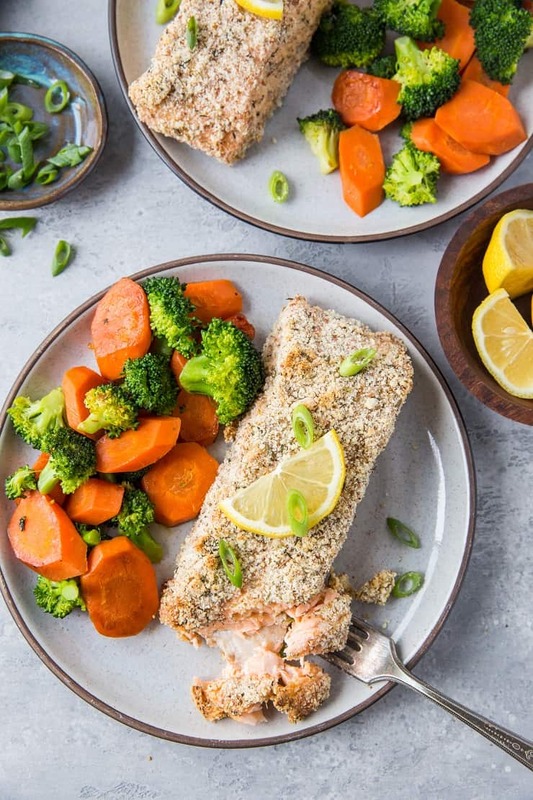 Crispy on the outside, moist and tender on the inside Almond Crusted Salmon made with only a few basic ingredients. This easy recipe is paleo, keto, whole30, and mouth-wateringly delicious! This post is sponsored by Raley’s. After going paleo a million (okay, eight) years ago, I missed my crusted animal protein. In particular, I missed my saucy chicken parmesan and crispy crusted fish. There’s just something about a crispy outside and a tender, melt-in-your-mouth inside that wins me over each and every time. …But then I got smart and figured out how to make crusted chicken and fish in grain-free fashion. While a traditional crust is made using wheat flour, it can easily be made using whole nuts and/or nut flours as well! In essence, there’s no need to miss those classic recipes if you live a gluten-free lifestyle or limit your intake of grains. 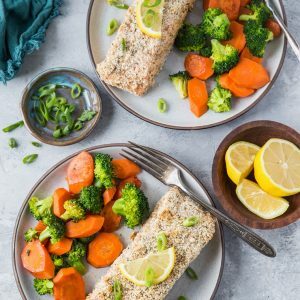 Aside from the fact that this crusted salmon is completely drool-worthy, I have found it’s so easy to prepare using all whole food ingredients! If you read my Cranberry Pistachio Vegan Shortbread Cookies post in December, you know I shop at Raley’s here in Reno daily. 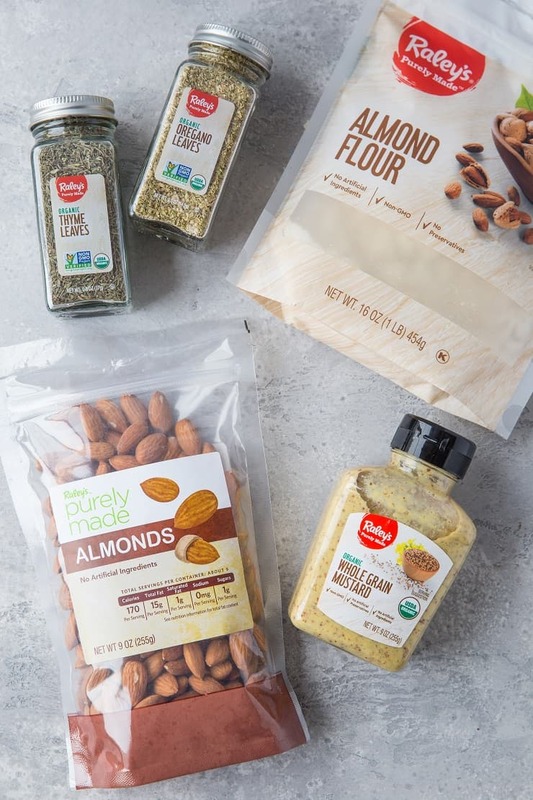 What’s new and exciting is they have recently launched Raley’s Purely Made, a line of Private Label products that deliver great quality at great prices! 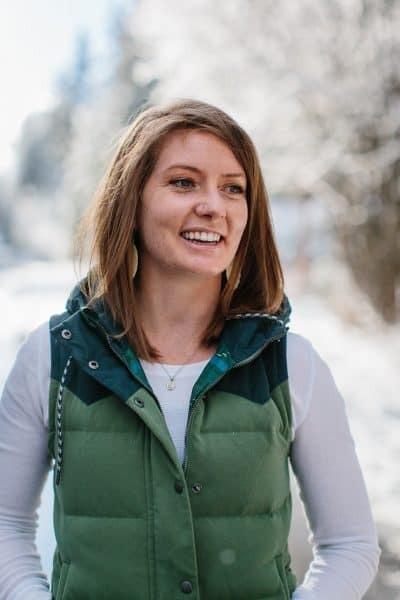 The mission behind this Private Label is to make clean eating affordable by offering products that are thoughtfully crafted and real at a lower price. Raley’s Purely Made products are free from 101+ artificial preservatives and ingredients and are also free from chemicals such as Bisphenol A (BPA), found in packaging. As someone who always buys organic whenever possible, it pleased me greatly to see that much of the Purely Made line is organic. From spices and whole nuts to flours, eggs, meats and produce, you can fashion up entire recipes using all Purely Made Ingredients. 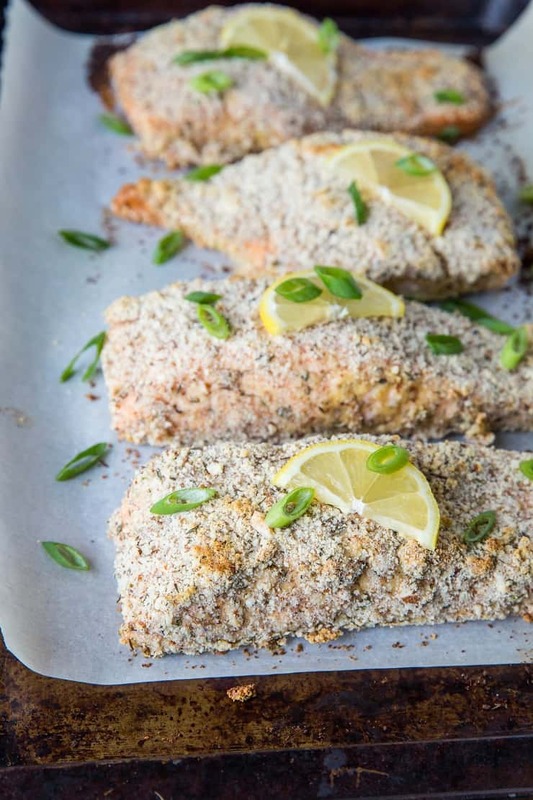 …Which brings me to my next point..
To make this Almond Crusted Salmon, I used Raley’s Purely Made almonds, almond flour, dried oregano, dried thyme, and whole grain mustard. The recipe is so easy to prepare, and the result is the moistest, most delicious salmon with a delectable crust on the outside. It’s basically a salmon lover’s dream come true! Grind up the almonds in a food processor (or blender) until they reach the consistency of cornmeal. Transfer it to a mixing bowl along with the almond flour, salt, and dried herbs, and stir everything together. In a separate bowl, whisk together the egg, water, and mustard. 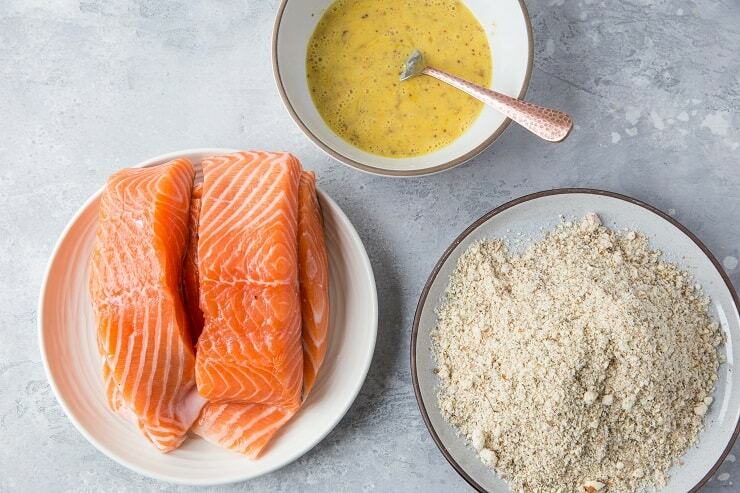 Dredge a salmon fillet in the egg mixture, then place it flesh-side down on the flour mixture to coat. Place the fillets on a parchment-lined baking sheet and bake to perfection! 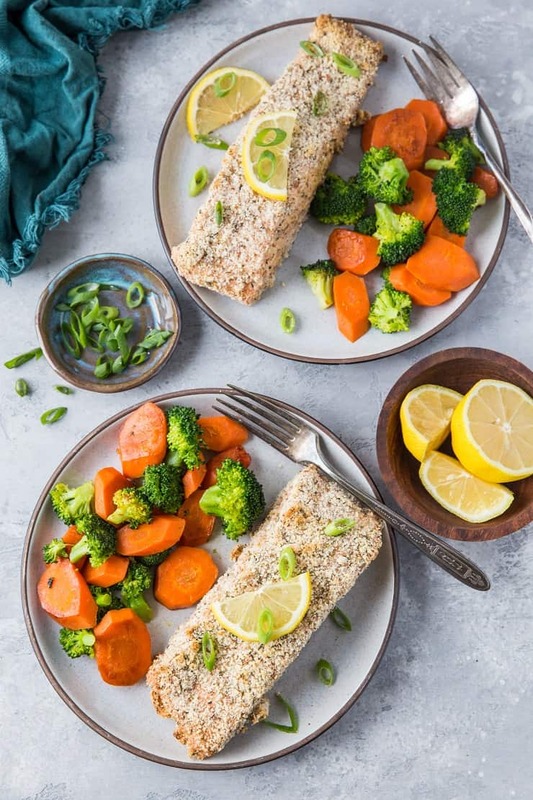 Serve the almond crusted salmon with your choice of roasted vegetables, stir fry vegetables, cauliflower rice, or regular rice. Be sure to check out your local Raley’s! It is a transparent, healthy choice at a value. 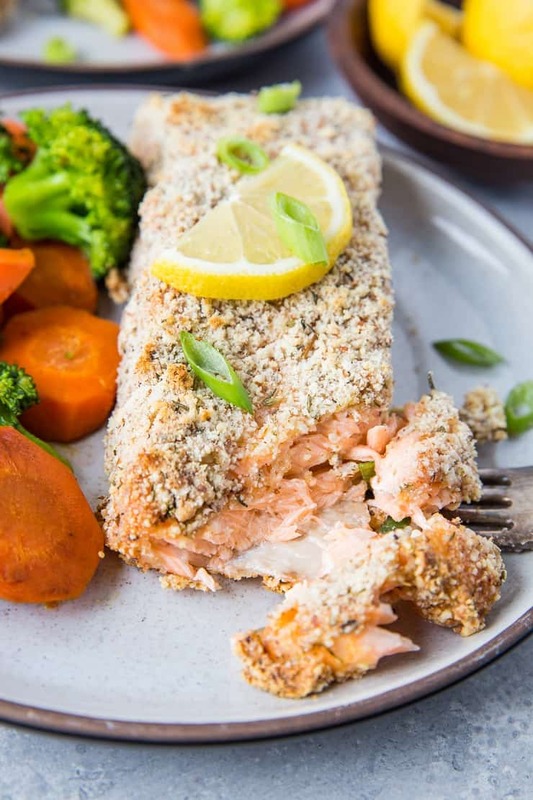 I hope you love this almond crusted salmon as much as I do! 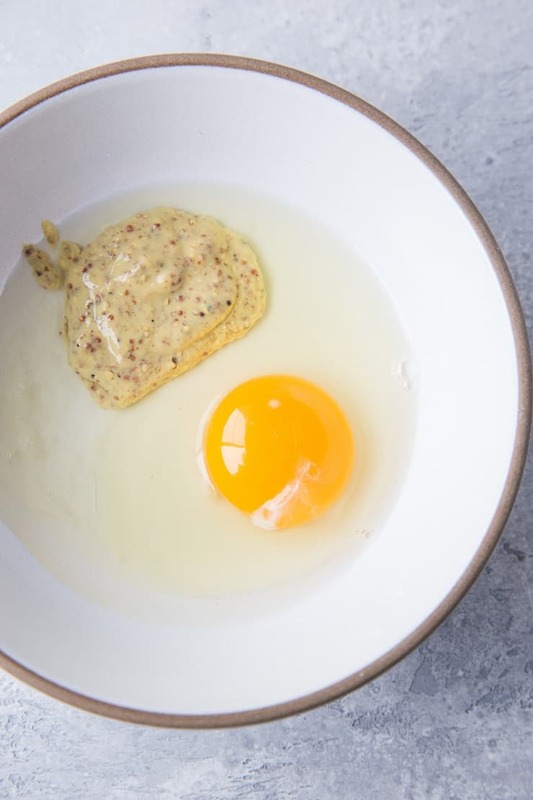 Whisk together the egg, water, and stone ground mustard in a bowl until well-combined. Pulse the raw almonds in a food processor or a blender until it becomes a coarse meal. In a mixing bowl, stir together the almond mixture, almond flour, sea salt, dried oregano, and thyme until well-combined. 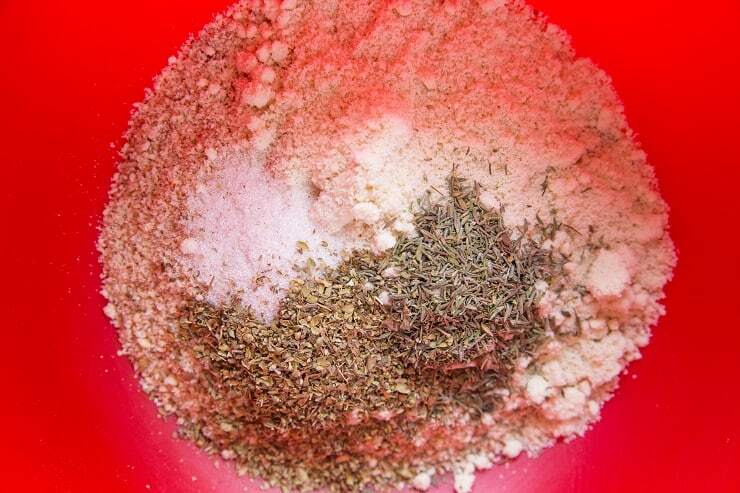 Dredge each salmon fillet in the egg mixture, then transfer it to the almond-herb mixture. Use your hands to coat the whole surface of the fish in the almond mixture. 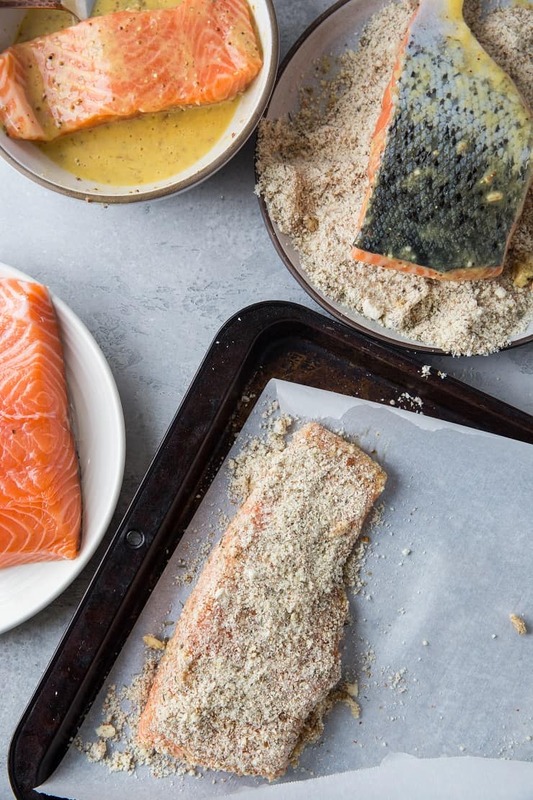 Transfer the fillets to the parchment-lined baking sheet and bake in the preheated oven 15 to 20 minutes, or until salmon is cooked through and crispy. Serve almond crusted salmon with lemon wedges and your choice of side dishes and enjoy. Click here for more information about Raley’s Purely Made products and it’s Banned Ingredients list. It’s nice that Raley’s is so close to home and on my way to and from work. They do have great salmon in their meat department. 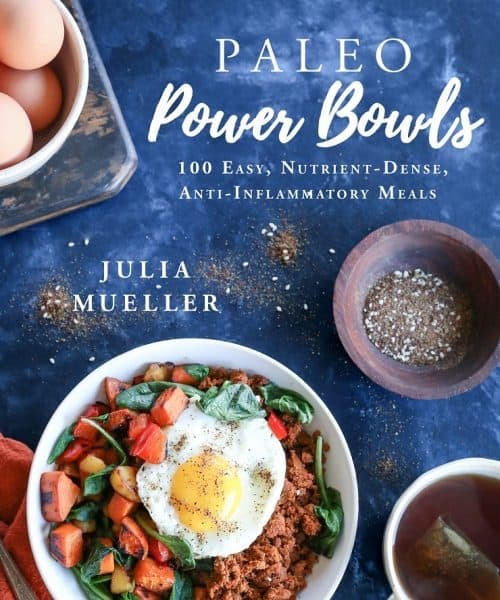 Yummy recipe, Julia! We will make this tonight! This salmon is absolutely delicious– I’d definitely make it again! The salmon crisped up wonderfully and was full of flavor. Small edits I made: I added 1 tsp of zaataar to the almond mixture, I used slightly over a cup of almonds and only 1/4 cup almond flour. I also drizzled olive oil on the parchment and on top of salmon before baking.